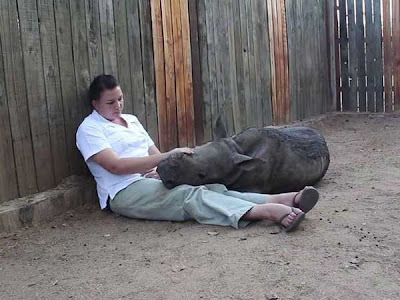 A baby rhino, who has been left traumatised after seeing his mother brutally murdered by poachers, refuses to sleep alone. He was rescued from the wild last month by staff at Hoedspruit Endangered Species Centre in South Africa after he was found next to his mother's body, crying inconsolably. 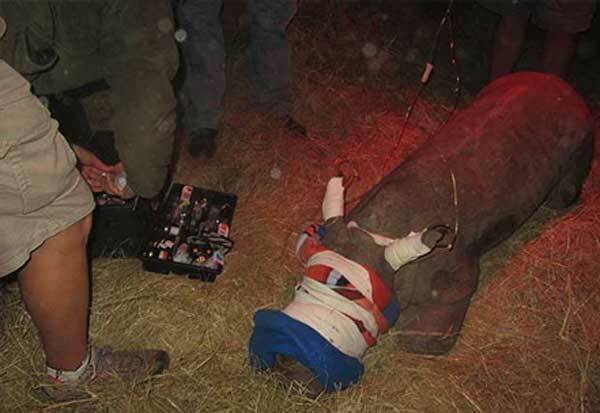 The rhino, known as Gertjie, is now recovering at the centre but has been unable to sleep alone after the ordeal, so the team take it in turns to feed the animal every three hours and sleep outside his room. The centre is now appealing for donations to help keep enough fat-free milk in stock as baby rhinos are only weaned off milk when they're over a year old. Staff say he will be cared for until he is ready to be re-introduced into a wildlife reserve. There's more information about Gertjie here.